Each job starts with a consultation regarding the necessary dimensions of the proposed duct plug. We will ask for measurements, photos, details of the surroundings where the balloon will be installed and are available to travel for on site consultations. Once these details are obtained, we'll create a drawing showing the proposed inflatable. 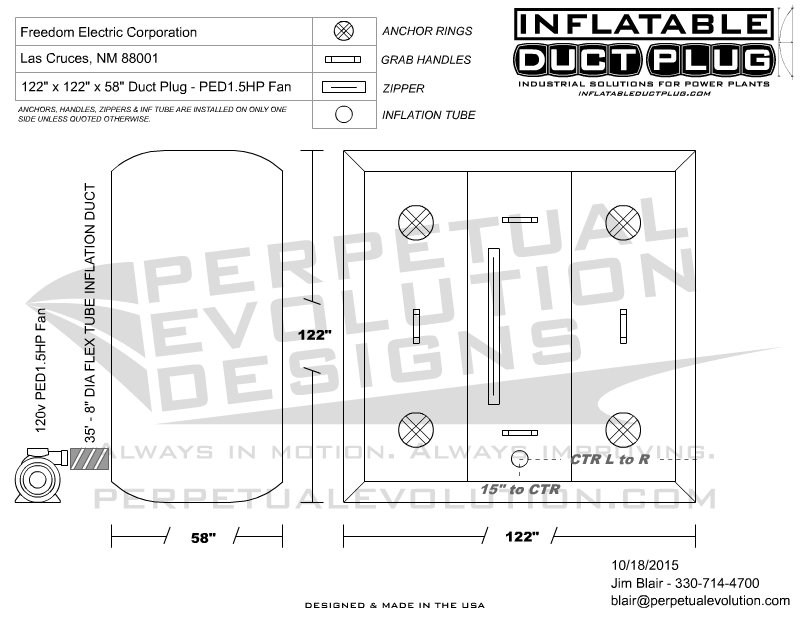 These layout drawings show the location of anchor rings, webbing handles, deflation zippers and ports or inflation tubes. Anchor rings and handles are typically installed on only one side of the inflatable. If additional hardware is required, the drawings and detailed quote will cover that. Anchor rings are typically installed in the corners of unit and in varying distances between those corners depending on the project's size. This also applies for webbing grab handles. Our handles are constructed using two layers of 2" seat belt webbing, with the bottom layer being stitched first to the inflatable, followed by the second layer that acts as a handle. This puts the majority of the load on the first layer of webbing and not just in two connection points to the pack cloth. Duct plugs are fairly easy to position as they inflate. Hoist cables can connect to either anchor points with steel d-rings or webbing handles to help guide large balloons while they inflate. Once inflated and in position, the blower and inflation tube can be adjusted like a soft hose or flexible duct, allowing it to be positioned away from designated paths and work areas. The drawings on this page cover two basic styles of duct plugs, a rectangular shaped duct plug and also a round stack balloon. Stack balloons are suspended inside a combined cycle HRSG Stack via a support rod that can be installed directly above the access panels. 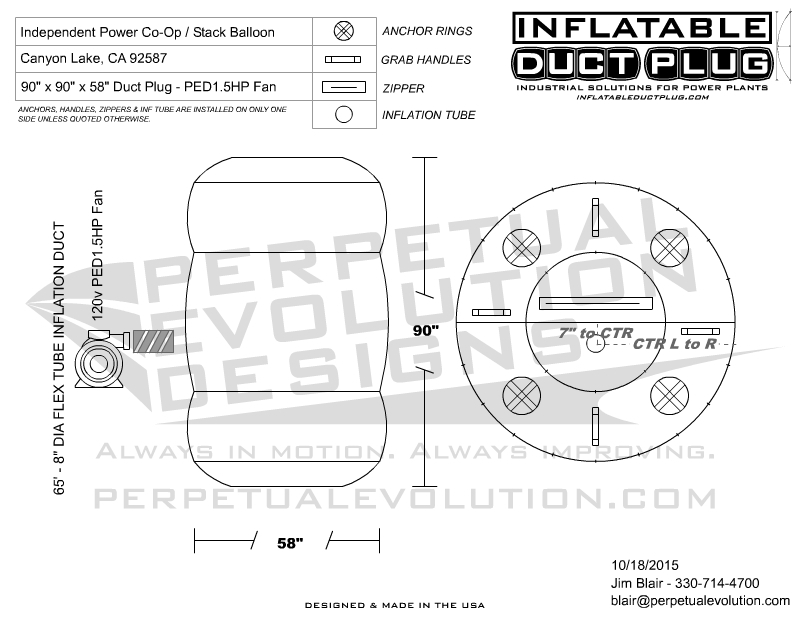 Inflation sources vary and can be installed on the round face or on the circumference side of the balloon. When the inflation tube is installed on the working surface, it's important to note that the thickness of the balloon is that which allows a seal to form above and below the inflation port location. The thickness of the stack balloon should exceed the height of an access door. Anchor rings are installed on the top surface of the stack balloon to allow ropes or cables to pass through and allow the balloon to follow these as a suspension guide when inflating inside the stack. Stack balloons are designed to inflate slightly larger than the diameter of the stack to ensure a good seal. This calculation is important in that making it too large will result in a crease at the edge, decreasing it's effectiveness. Zippers are installed on the top surface of the balloon and are sewn in directionally to be able to be pulled open when standing at the access point using a remote string attached to the zipper pull.